Console-based RTS titles walk a fine old tightrope. On one hand, players want tough challenges, complete with more and more extreme levels of detail. On the other hand, those challenges have to be something that you can overcome without the maneuverability of a mouse-controlled cursor. Developers know all too well that a shabby control system can easily put paid to all the research, all the graphical polish, and all the AI improvements that they’ve worked on. Sudden Strike 4 is the first title in the franchise to reach consoles and was always going to be a tricky port, given the in-depth nature of things in the previous titles. 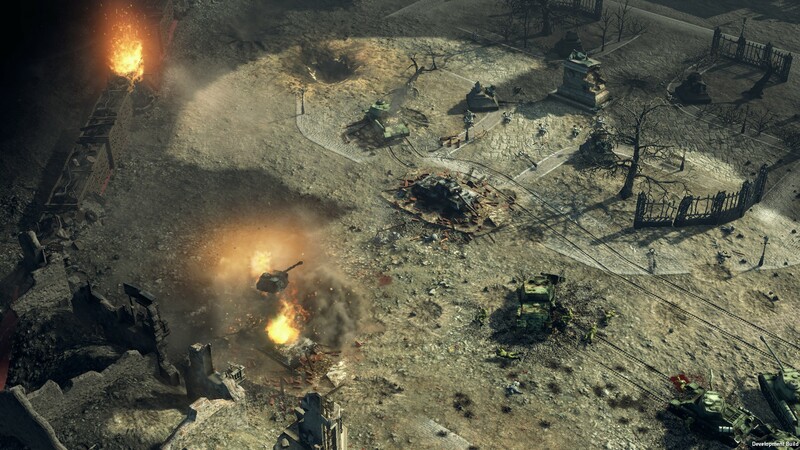 Set in World War II, the game lets you take control of the German, Soviet, or Allied forces in three separate campaigns as you revisit famous battles from the conflict. 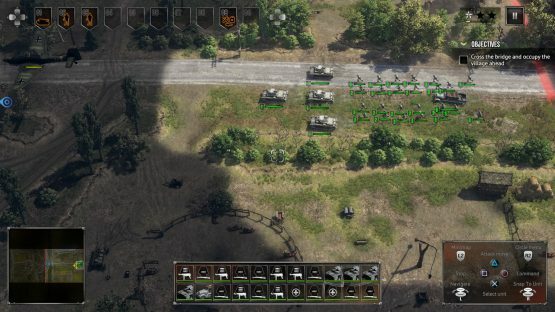 You can replicate the heroics of such battles as Operation Market Garden or Operation Overlord as the Allies, fight to win the likes of Operation Barbarossa as the Germans, or try to lift the Siege of Leningrad or win the Battle of Moscow as the Soviets. Each army has three available commanders that you can choose to play as, who each have their own skill trees that provide benefits to the forces on the ground. Selecting the right man for the job is absolutely key as some of the buffs have the ability to turn the tide of a battle in relatively short order. No matter who you choose to play as, the voiceover is portrayed by folks with American accents. It’s a bit strange to hear a Texan say “Yes, Herr Commandant” without even trying to force a bit of a German lilt, only to find the same voice calling you “Comrade” in the same manner in the next battle. I’m guessing the budget didn’t stretch to getting people to even try to fake it. Gladly, those limitations don’t persist throughout and as a result, Sudden Strike 4 looks and sounds great. Your squadron of tanks charging through hedgerows and flattening buildings on their way to relieving a pocket of infantry who are under fire is a grand sight and no matter how many units are on screen, everything seems to hold up in terms of performance. As I mentioned however, this was always going to be a tricky port. There are control problems that hamper the enjoyment of Sudden Strike 4 at almost every turn. Units can be selected individually by simply hovering the cursor over them and pressing X, while holding X brings up a circle which can be widened or narrowed with the right stick to allow you to select multiple units. Once you’re in command of a group, you can press R3 to assign that group a number. When you’ve got a bunch of groups, you can quickly switch between them with the d-pad. It’s all simple enough until you just want to set up a squadron of tanks and end up selecting the infantrymen that are stood by them, or you want to create a battalion of infantrymen when a supply truck has decided to roll into the middle of their group. If you do get your squads set up as you’d like and decide to send one to the east and another to the west, the camera doesn’t automatically bring your squad into view when you switch between them, so on larger maps you’ll feel like all you’re doing is scrolling. A distinct lack of clear feedback also causes problems at times. Hover over a downed ally and a “heal” cursor will often appear. Issue the order and you generally have no idea if the command was accepted or not. You might have pressed the wrong button, but then again, maybe you didn’t and the medic is just taking a while to get to him. Who knows? The same can be said for simple things such as ordering attacks, asking for repairs, or requesting that one of your infantrymen throws a grenade at a target. It doesn’t help that the action button changes. One minute you’re asked to press X to issue a command, but in other cases the X button cancels your selection and the circle button is the one you were looking for. A button map appears on screen at all times, but that doesn’t mean that you won’t constantly be making the wrong choices for far longer than you’d expect. Some very dodgy pathfinding by the AI can throw a spanner in the works as well. Ordering your group into a logical formation is simple enough – point at where you want them to go, hold the circle button to order them into formation. But if the route to the target destination is too narrow, units will often just wander off and get lost. On a relatively open map, that’s fine. In the Soviet campaign where a tank (or personnel carrier full of troops) can veer off and crash into a hole in the ice and be destroyed…not so much. Sudden Strike 4 also incites confusion in the player at times by lack of clear indicators. When the guys in that sinking APC jump clear of the truck and are on the ground injured as a result, you might be able to save a few of them if you can work out if one of the dozen identical men remaining on their feet is a medic. You could even protect them from further injury by providing covering fire from a machine gun nest if you could reliably determine if there was anybody manning the gun or if you need to send someone to do it. Online multiplayer skirmishes can be more entertaining than the campaign due to a levelled playing field. They are simply that, though – bare-bones one-off skirmishes. Sudden Strike 4’s issues are a real downer, as they get in the way of what is an otherwise well put-together challenge. Some impressive detail regarding the things that you can do – holing up in a house to launch a surprise attack, for example, or leading enemies into trouble by using a faster vehicle as a decoy – means that the game must go out of its way to stop you from being able to just walk through it using every old trick in the book. The development team has gotten that side of things right so if you can see past the barriers that sit in between you devising a tactic and actually getting the game to carry it out, you’re in for a moreish test for the old grey matter. The greater likelihood though, is that confusion and frustration will kick in before the addiction does. Sudden Strike 4 review code provided by publisher. Reviewed on PlayStation 4. For more information on scoring, please read our Review Policy here.